Last time I posted, I wrote about our photo tour to Arizona. This post is about the "after tour" - the few days afterward that Paul and I stay to explore new areas on for the purpose of launching future tours. The entire state of Utah is ripe for epic photography, and we were already right there, so why not? Since Paul has already extensively photographed through Zion and some of Arches, we decided to visit the other 3 of the "Big Five:" Bryce Canyon, Capitol Reef and Canyonlands. Put them all together, and you have a photo tour to all 5. We began the long ride back north directly from the airport. Phoenix to Bryce Canyon is a 7 hour drive, and we were on a mission to make it for sunset that evening. And we did! We spent about an hour shooting the hoodoos as the sun set behind the cliffs, and then stayed up most of the night trying to capture the Milky Way, which is a lot harder than it seems, since the canyon is so deep. And, to make it even more difficult, there is almost always a group of people attempting to light paint here and across the Southwest. This sort of thing could work if done correctly, but if you're trying to photograph the whole canyon while someone else is light painting, you can forget about making a nice photo. Waiting for them to finish or leave is what makes night photography in Utah very patience-intensive. Despite the light painters, Paul made a great panoramic image of the Milky Way Center. Even though we spent the whole day driving, and the whole night photographing the night sky, we managed to get ourselves up and out of bed for this amazing sunrise too. Tired and sleepy, but worth it! We like to keep our eyes out for interesting compositions that you may not notice had you not been looking. The shot most go for here at sunrise is the sun rising over Thor's Hammer, the stone spire on the right hand side. Instead, Paul waited for the right moment and captured the sun flaring through this natural window. We think it makes for a more interesting and pleasing shot. Join us on any photo tour and we'll teach you how to keep an eye out too. After the morning, there was one stop I wanted to make in the nearby Grand-Escalante area. I had seen photos of this place from various photographers, so I wanted to see it myself too. The Zebra Slot Canyon is a small, extremely narrow slot canyon that you can walk into if you follow an unmarked trail all the way to the end, which can seem extremely long if the weather is clear and hot. I couldn't find any official trail listings for this place, and the only advice I could find were in blogs that didn't have very specific information (like distance!). If you're going to do this hike, make sure you bring enough water and sunscreen for an approximate 5 mile hike, roundtrip. There is some sand which makes walking difficult. We left our camera packs in the car, knowing how narrow this was going to be. I consider myself a very small person, but even I struggled getting into the canyon. There are water pockets requiring you to ditch your shoes, and you'll have to force yourself up the wall a little bit too to get over a log. If you do all of this, you'll be rewarded with a cool shot like this one. We didn't see the cool and warm light at the same time, but nevertheless, the patterns are really nice. We then headed to Capitol Reef National Park. 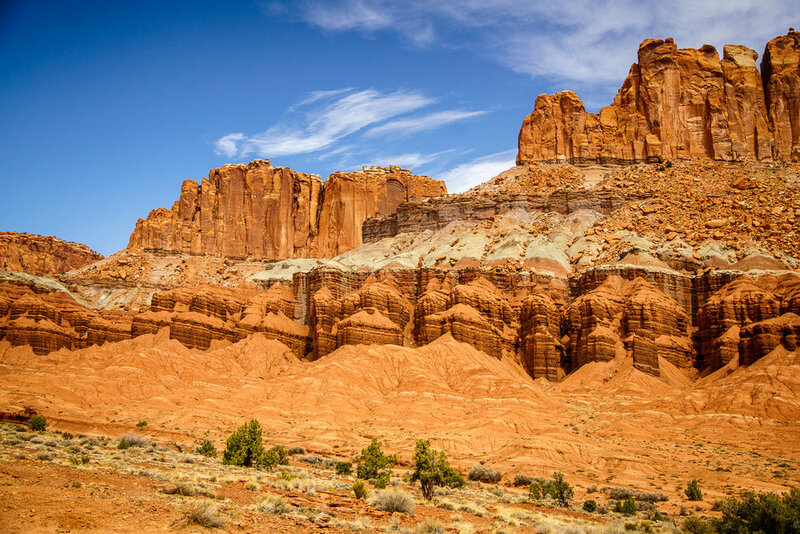 Capitol Reef is a big park, about 60 miles long and 6 miles wide, enveloping the Waterpocket Fold. If you come here, make sure you program the actual park entrance and not just "Capitol Reef National Park." Our GPS took us a very long way out of the way. We didn't realize it until it was almost too late. According to our GPS and Google, it would take us more than 2 hours to drive from where we were (on the Southeast corner, dirt road) to the main entrance. Somehow, I made it there in under 45 minutes. Even shaving 5 minutes off the estimated time is an achievement, so I don't know how that's even possible. I deserve a T-shirt or something. This park is very desolate. We saw very few people here. But even so, there are some cool features that have photographic potential. One of them is on a short hike we did called "The Tanks." Natural sandstone pockets in the earth collect rainwater, and on a cloudy day could look really cool with a reflection. Unfortunately, when we went, it was very dried up. 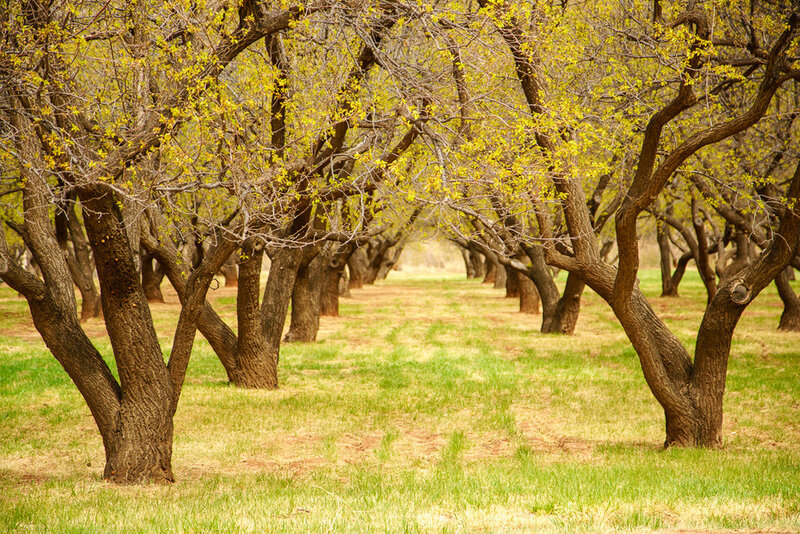 There are interesting facets of this park, like the Mormon settlements and orchards within. There are lots of little caves and even cliff drawings here. After Capitol Reef, we made our way toward Canyonlands. We made a stop (a couple of times) at Deadhorse Point State Park, which overlooks a bend in the Colorado River. The wind here was more powerful than anything we've experienced; there was a moment I thought my camera gear could have flown away with the wind. The most famous part of Canyonlands is Mesa Arch. We tried photographing it at night time, pleased that there was no one else there to ruin our shots. Be careful at night, don't get too close to the edge! The next morning was clouded over, but by around 7 or 8 AM the sky had cleared. Paul made the trip back to capture this sun flare as the sun was rising higher into the sky. We love how you can see the landscape through the arch. On our potential photo tour, we'll take a small group of photographers here to capture the sun flare inside the arch at sunrise. After Canyonlands, it was time to make our way back home. We were flying out of Salt Lake City. The area is surrounded by some pretty mountains and farmland. We made a quick stop for some photos of these sheep. While we were taking pictures, the owner saw us and decided to show us a one-day old lamb that was born that morning.It was so awkward and cute. We made it to SLC in time for sunset, and I managed to find a nice spot of the temple, perfectly reflected. The Church of Jesus Christ of Latter-day Saints has a small part of the city cut out just for them - and it is amazing. The architecture and gardens are so well-kept and curated. I'd say it's worth a visit if you're in the area. We'll be launching a photo tour based on our itineraries to Utah: The Big 5 in 2019. If you're interested in joining us, feel free to comment or email us.